As many of you will already be aware, I will be moving on from my role as Better Care Support Team Programme Director in September. I am taking up an opportunity to lead Kingston Foundation Trust in London as Interim Chief Executive. I have enjoyed my time working on Better Care greatly and learned a huge amount about what great things are happening across the country, as well as a little more about how Whitehall works. Discussions are underway about my replacement, and I will update you as soon as more information is available. I wish you all the best of luck in implementing your Better Care Fund plans and making a difference to the care that people receive. The Q1 template should be used to report Better Care Fund performance for the period 1st April 2015 to 30th June 2015. A completed return should be submitted to the Better Care Support Team inbox (ENGLAND.bettercaresupport@nhs.net) by midday on 28th August 2015. Guidance for completing the template can be found on the first tab of the template. As mentioned in my update note a few weeks ago, the Better Care Support Team is commissioning a peer led review and improvement programme as part of the support offer to enable successful delivery of better care. The peer led review aims to build awareness and understanding of what the priority issues are to address within health and care systems to implement Better Care Fund plans. It is intended that the peer led review and improvement process will provide teams with an assessment of the progress that is being made in their locality across all aspects of better care implementation and will enable areas to identify challenges, priorities, opportunities and assets. The programme will initially involve 6 pilots across England. After evaluation of the pilot programme, the Better Care Support team will review options for commissioning an ongoing programme in order to reach a greater number of areas. We are still looking for areas who would like to receive the benefits of this support offer. If you would like to participate in the peer review programme or would like to make suggestions regarding possible pilot sites, please contact adiba.enwonwu@nhs.net by 21 August 2015. In this week’s ‘Meet the Team’ we meet Mary Hill. Mary has been working in the team since June, developing the support offer around workforce planning, data sharing and IG. These are areas which emerged from the readiness survey as some of the key barriers to implementing BCF plans and integration. She is employed by the LGA and previously worked in the children’s policy team on safeguarding and social care, including the leadership essentials programme for lead members of children’s services. Mary has spent some time working in the voluntary sector at Barnardo’s and YMCA England in policy, research and lobbying roles on a range of topics, including child poverty, welfare reform, housing, and young people. 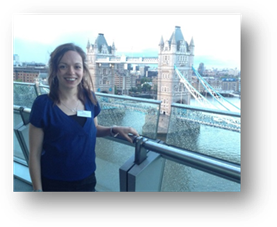 She has also worked for London Councils and completed a two year graduate training scheme at Greenwich Council. More unusually, she taught English in China for two years and can speak some Mandarin – though she hasn’t had a chance to use this yet in her role in the Better Care Support Team! Outside work, Mary has just regained some spare time in the evenings having recently finished studying for her MSc in social research methods. This means she can fill even more of her spare time acting as a climbing frame for her 2 year old daughter, and teaching yoga (not at the same time! ).